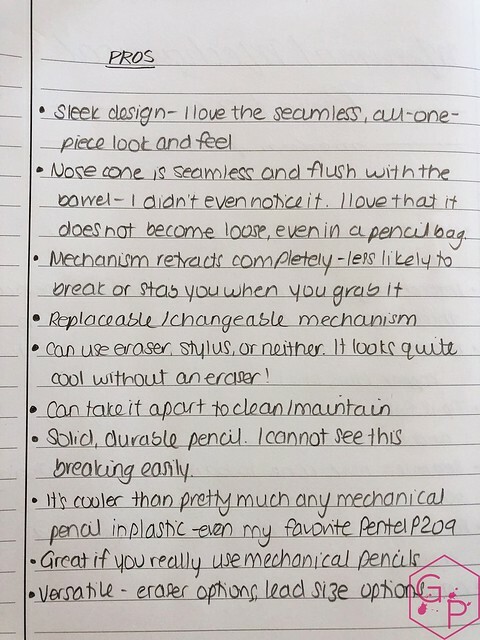 Thanks to Andrew for sending this pencil for a review! 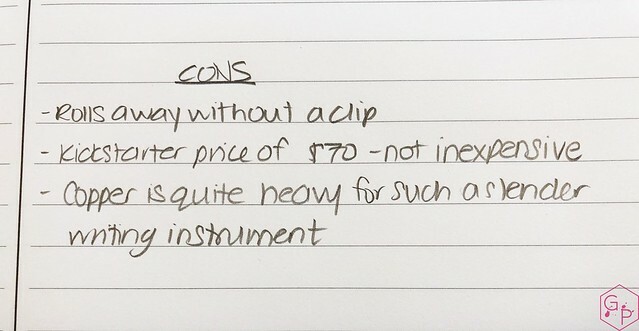 I have since returned it and am still using a sad, plastic mechanical pencil that is just not quite as awesome. I am reviewing a unit on loan, but here is what Andrew sent over in this package: a cork sleeve, an Allen key, a cleaning key, an eraser, a copper plug, and a stylus tip. Very cute and simple. I especially appreciate the replacement parts. 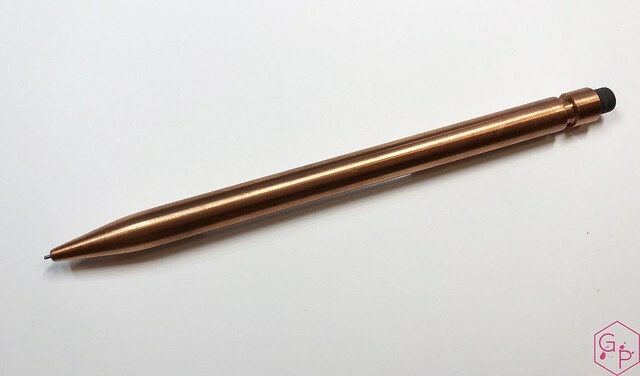 The copper mechanical pencil shares the shape of a regular disposable mechanical pencil but it looks way cooler. The pencil is round, tapering at the section and nose. 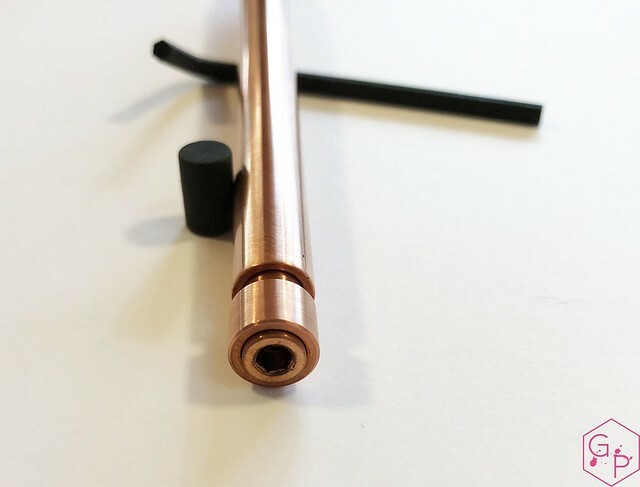 The knock mechanism is also copper and is plugged with a black rubber eraser in its standard configuration. This can be replaced with another eraser, a stylus tip, or a small copper plug (for what I think is a really cool effect). The copper arrived shiny and began to patina after a few weeks. I like the patina - it was slow to develop and it is not as drastic as I usually expect from copper, but I don't mind. It's a bit of character. I also like the finish on the copper - it looks slightly brushed. 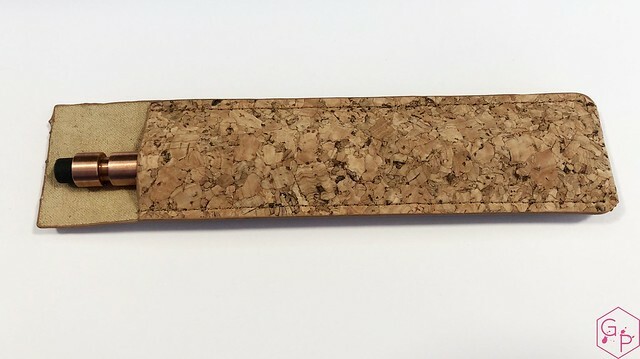 The cork sleeve is a slim rectangle with a soft inner liner. It's a simple sleeve. I think a more form fitted leather sleeve in black or slate grey would have looked really cool. 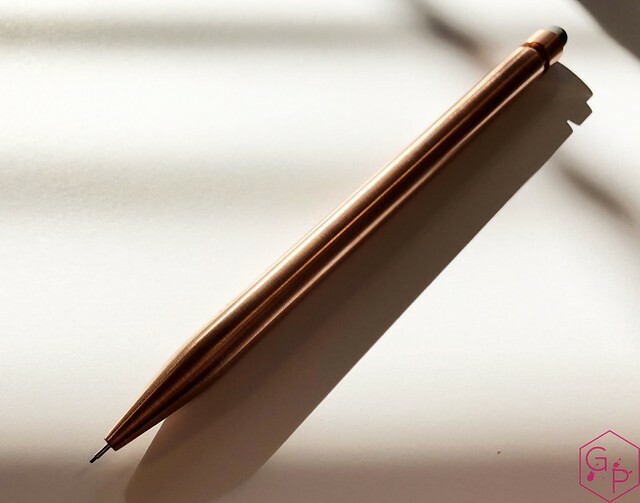 The copper mechanical pencil looks solid and robust; it feels solid and robust, and substantial in hand. It also functions well. Let's go into some detail! 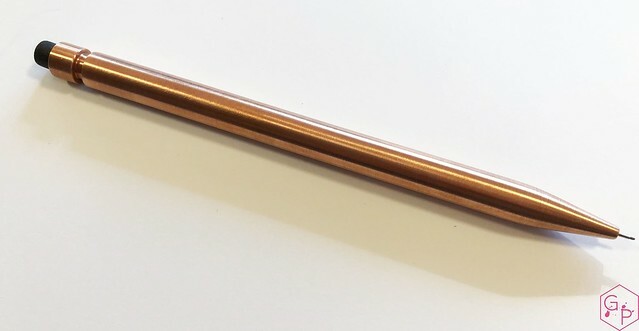 The pencil is made from one solid piece of metal and considering this is copper, it is heavy! The tip retracts fully into the nose of the pencil so there is no risk of stabbing yourself or breakage of the metal tip or the lead. 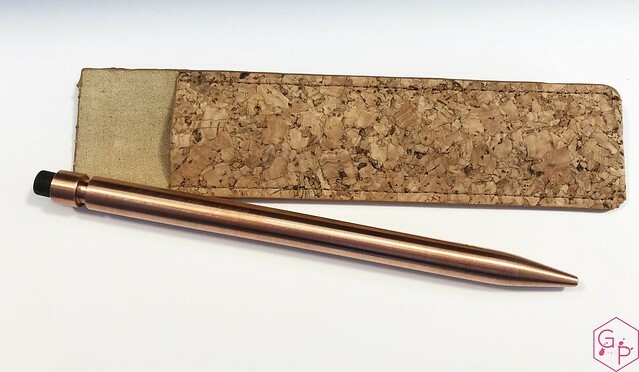 The body of the pencil is smooth with a touch of texture I associate with copper. It definitely smells like pennies and the smell does transfer to my hand. I'm not crazy about the standard refill eraser, after having been spoiled by fun erasers like the Palomino Blackwing pencil erasers. However, the little eraser works in a pinch. 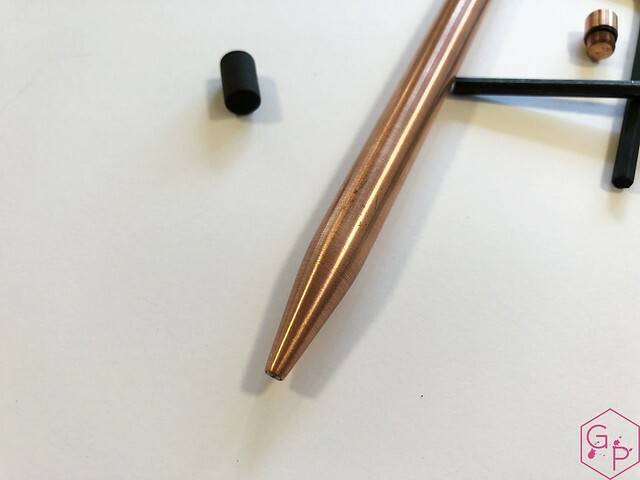 The stylus tip also works well - responsive and practical should you need a stylus, but my favorite replacement piece is the copper end plug. It looks so cool and gives the pencil the all-metal look, no interruptions to its design. 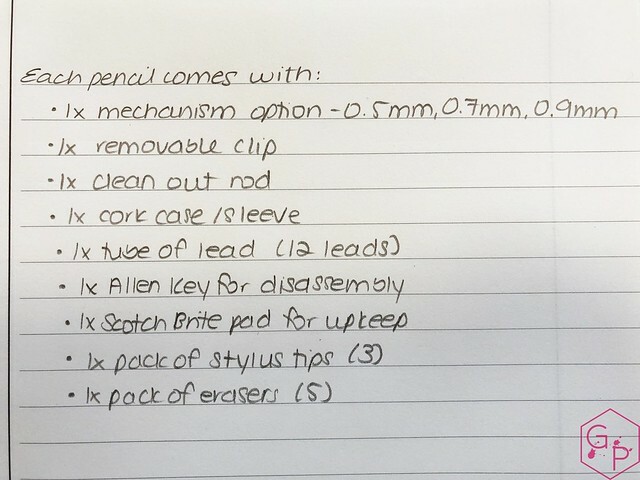 The pencil is easy to refill through the back and it can also be disassembled with the included Allen key. Oddly enough, I never felt the need to take it apart at any point. The nose cone is attached seamlessly via the internal threads and an O-ring for added smoothness and security. Overall, it is sleek and cool and much better looking than a plastic disposable Bic. 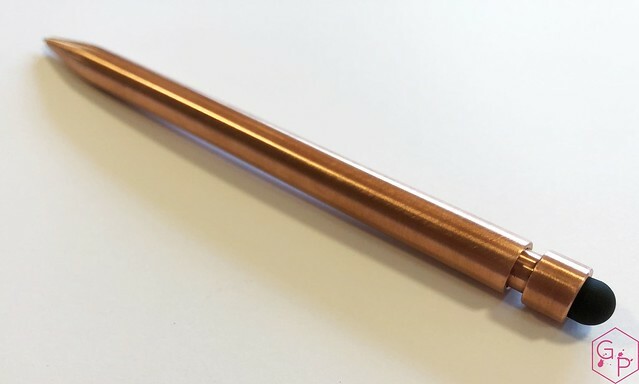 I love copper and how it looks, but I found the copper pencil here heavy to use for longer writing/drawing sessions. That is not the fault of the pencil - I specifically requested the copper version because it's one of my favorites. The titanium or stainless steel would be a better permanent option for me. There are two downsides for me. 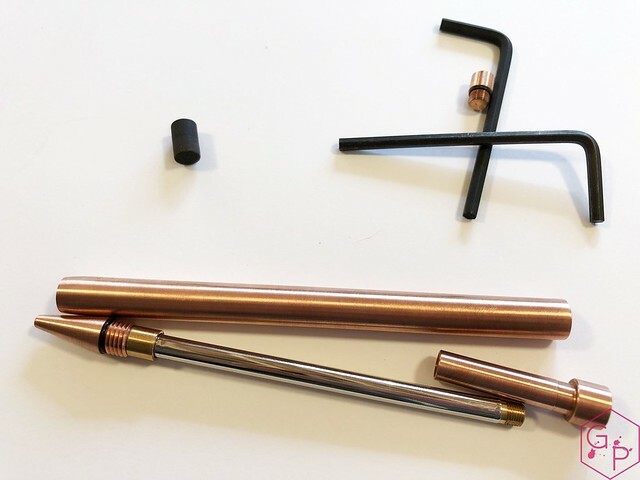 The first is because I enjoy the copper end plug the most, I cannot easily refill the pencil on the go without the Allen key to remove the plug. You could also leave it finger-tight and unscrew it on the go, but that seems risky. I resorted to putting a single piece of lead in through the tip, which can be tricky. I also found it a bit confusing to take apart and reassemble. There is a video on how to do it, but that makes it feel complex for a pencil. Neither of these is a deal breaker for me, just observations. As a pencil in use, there were no issues. In fact, I experienced minimal lead breakage because one click gave me just the right amount of lead to work with. In addition, I didn't have to apply any pressure to the lead to write because the weight of the pencil allowed it to 'write itself'. I love the interchangeable mechanism - less waste, less to carry. I love quality items that reduce waste. The less plastic that is tossed, the better. 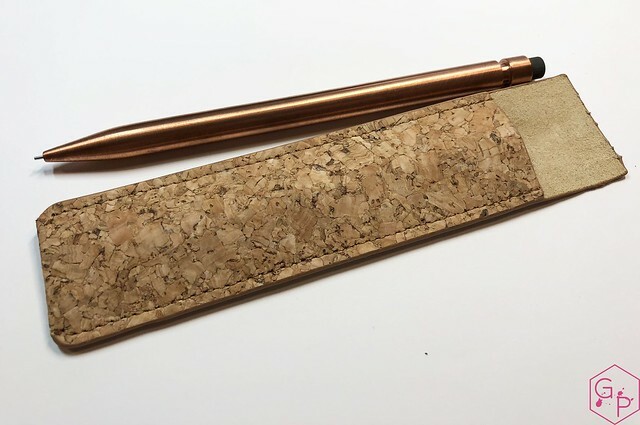 I don't know what the ecological cost of machining these pencils is versus the benefit of fewer plastic pencils (and their plastic packaging) being tossed is, but I'm glad this option is here. Next time, I would pick a 0.9 mm titanium model. 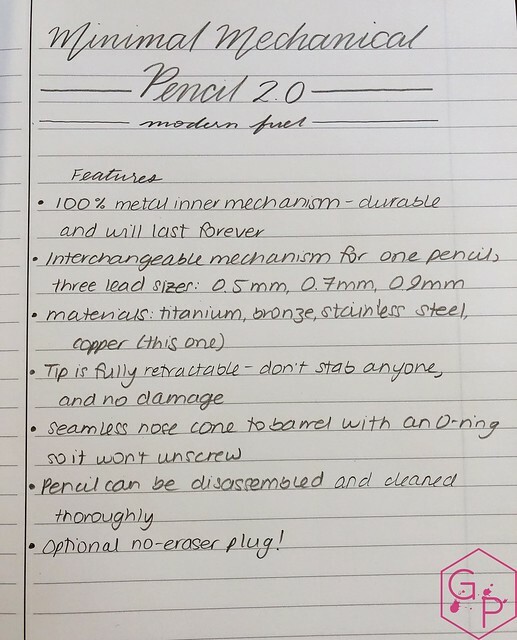 I don't have many mechanical pencils and I don't want to have to replace them often, so for the few that I do own and acquire, I want them to be great. Although this pencil may not be for everyone, just as every pen/pencil is not for me, I still appreciate that Andrew is presenting the stationery world with another option. The more, the merrier. 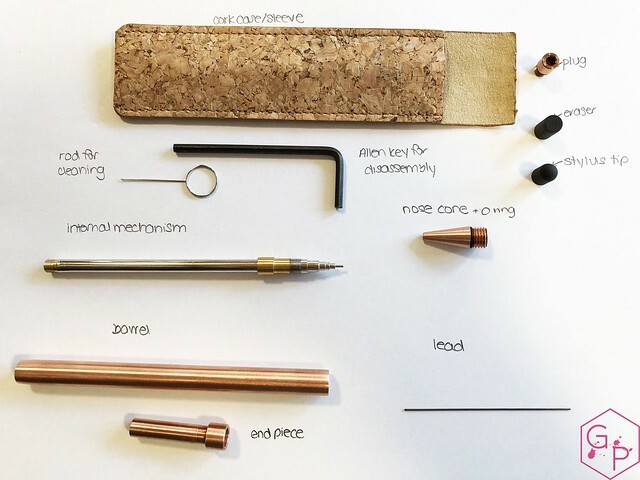 Check out the Minimal Mechanical Pencil 2.0 project on Kickstarter! I received this item free of charge for the purposes of this review. I was not compensated monetarily for my review. Everything you've read here is my own opinion. There are no affiliate links.